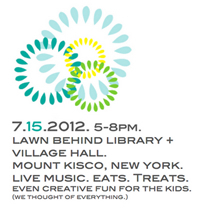 Kisco Summer Sunday is an all-new event for Summer 2012! The brainchild of the Occupy Main Westchester movement, Kisco Summer Sunday is an event for residents, merchants, biz owners, and visitors to get together after a long week and unwind – with live music, food and activities for the kids. The real purpose? To build buzz for our town. We want people to know that Mount Kisco is a great place to live, work, start a business and raise a family. We hope our little grassroots organization — and this fab event that has been born because of it — can be the catalyst to propel Mount Kisco forward and fill all those vacant storefronts! Our first event will be on July 15 from 5-8pm on the lawn behind the library. Find out more at www.kiscosummersunday.com.